A mammoth is defrosted into an unrecognisable future in Rory Waudby-Tolley's first-year Royal College of Art film. Remember that cult 1992 Pauly Shore film where Brendan Frasier plays a frozen neanderthal who’s thawed, revived and introduced into modern society? 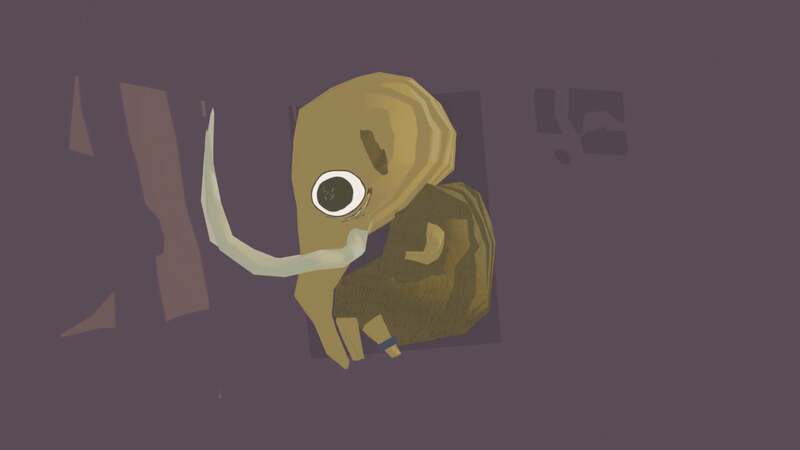 Well now imagine that narrative, but with Frasier’s character replaced by a mammoth and you’re part-way to understanding the narrative at the core of Rory Waudby-Tolley’s animated short Tusk. Created in his first-year studying for his Animation MA at the Royal College of Art in London, the narrative for his short developed from the filmmaker’s desire to “tell an entertaining story with a central character the audience could empathise with”. Combining this with an on ongoing compulsion for sketching pachyderm/human characters and the storyline for Tusk was soon born. “The film was initially inspired by an obsession with drawing these strange humanoid elephant dudes”, Waudby-Tolley admits when asked about his unusual storyline. “I’m not sure how that started, but the contrast of them interacting with a large mammoth was appealing to me visually. Like a pachydermal King Kong. There were a lot of stories at the time about cloning found mammoth DNA and reintroducing them to the wild. I ended up with a fairly simple plot that allowed me to explore themes that interested me; memory, the passage of time, and feeling alienated in a world you thought you understood…The treatment of the mammoth could be read as analogous to many different groups of people, and I’m happy to keep it ambiguous and up to the viewer to draw their own connections. I was initially unsure of what kind of voice she should have, but I think this quiet eloquence coming from a big hairy mess makes the most sense somehow. For all its silliness, I would like to think there is an emotional resonance there”. Although the director admits the aesthetic of his film was largely dictated by the constraints of having to do all the animation and sound design himself, Tusk is still a film with a strong and distinct visual style. Contrasting 3-dimensional characters against minimal flat-coloured backgrounds, the look of the piece really gives Tusk the impression that this is a character-driven narrative and helps puts the emphasis on its protagonist. “The visual look was very much informed by constraints. I had to animate the whole thing by myself, and do my own sound design, which was a challenge but also useful to think about all aspects of the films simultaneously…Due to lack of time, minimal backgrounds and a simple colour palate were used, says Waudby-Tolley, which also allowed the focus to be on character. Serving the script was always the main goal, so it was just a case of finding a way to make it happen. For the boring technical stuff: the elephants and mammoth were modelled and animated in 3D in Maya, with the faces mostly drawn over the top in TVPaint. I wrote a little Python script to make the models boil, and rendered flat colours on 2s, to integrate to the 3D and 2D. It was a bit of an experiment, but I think it actually saved a fair bit of time.”. Having recently completed his RCA graduation film Mr Madila – a hilarious short which chronicles Rory’s encounters with the titular spiritual healer – the filmmaker is currently looking to take his latest creation around the festival circuit, whilst also working on a BBC ident and a music video. If you’re attending a film festival over the next year-or-so where Mr Madila is playing, it’s a short well worth seeking out and in my opinion, one of the funniest you’re likely to see all year.